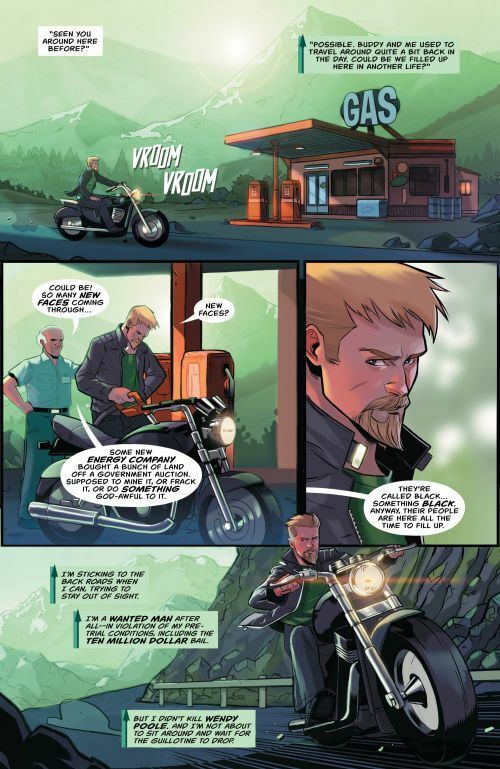 Green Arrow hits the road in the latest issue of his series, on the run while wanted on a trumped up murder charge back in Seattle, now Star City. He hasn’t gone far yet, the story in issue 26 takes place in the Cascade Mountains. The title of this story arc, which promises to send Oliver Queen across the country as he roots out the Ninth Circle, is Hard Travelling Hero. The name evokes the period when Green Arrow teamed up with Green Lantern, and they zig zagged around the country, looking for “America” in that late 60s way, and wound up finding themselves. It’s quite a bar to set. This story doesn’t quite reach it, but it comes close. The Flash guest stars in this issue, and we see why he and Green Arrow rarely team up. They just don’t much like each other. You can’t blame them. Their abilities and backgrounds are wildly different, they have nothing in common. The Flash doesn’t even particularly respect Green Arrow, commenting that he “makes a mess” wherever he goes. Oliver responds in character, with some name calling. Fortunately, things do go uphill from there, and we aren’t just left with bickering heroes. The Ninth Circle get tied in with the Black Hole, a secret organization that the Flash has been dealing with in his own book, as speed force abilities start to spread to humans and animals in proximity to a certain mountain. Though they are not given a lot of page time, there are also some good, quick scenes with Oliver’s lawyer, Kate Spencer, and Black Canary, who takes on a partner as she works to deal with the mess left behind in Star City. It’s a fun issue all around. The only thing lacking, considering the title of the story arc, is any real depth. Oliver doesn’t get much of a chance to grow or show any new facets of his character in this outing. Still, it’s the first installment, and that could easily change as the story goes on. 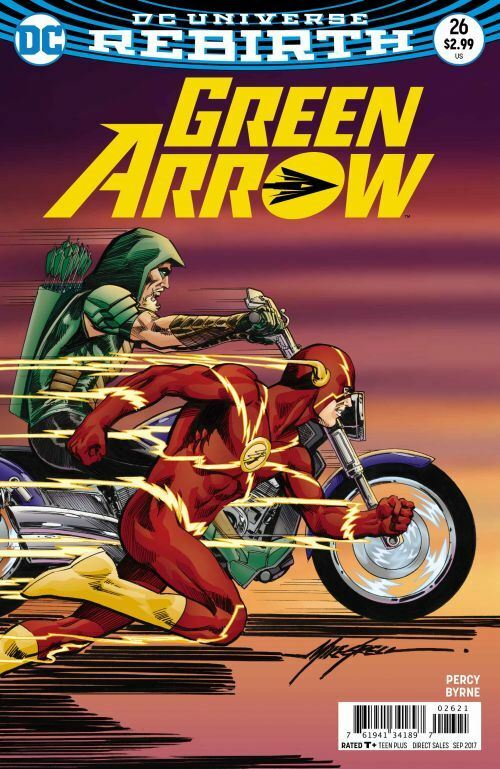 The Flash and Green Arrow do find a balance and work together by the end of the issue, and another major guest star is broadly hinted at for the following chapter.